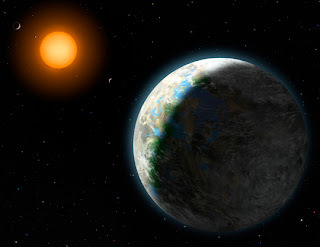 Professor Astronomy's Astronomy Blog: A habitable planet? Maybe. This will be short, as I only have a few minutes to blog. My students seem to want their homeworks graded for some reason. Yesterday, astronomers at UC Santa Cruz and the Carnegie Observatories announced that they had found the first known planet that may be habitable. The press release, available here, does a great job of describing the discovery, the discovery process (it was really hard work), and what we know about the planet. Alas, many of the news stories that have popped up online and on television do a poor job of all of these, which has led to some very garbled announcements. In short, though, the planet is about three or four times the mass of the Earth, and it orbits a red dwarf star that has at least five other planets. The star orbits within what astronomers call the "habitable zone", or a region around the star where liquid water can exist on a planet's surface. The planet, called Gliese 581g, orbits a red dwarf star called Gliese 581 which is about 20 light-years away from Earth -- very close as far as stars go. Red dwarfs have less mass then the sun and they don't shine nearly as brightly or as hotly, so this planet is located much closer to its parent star than the Earth is to the sun. This planet's year is only 37 Earth days long. Being so close to its parent star also means that the planet is likely tidally-locked, so that the same part of the planet always faces the red dwarf star, just like the same face of the Moon always faces the Earth. This means that half of the planet always sees daytime, and half always sees nighttime. The day face of the planet could be really hot, and the night side of the planet could be really cold. On the border between night and day, the temperature could be really comfortable. However, we don't know a lot of things about this planet. It was discovered by its gravitational pull on the red dwarf star, so we haven't actually seen the planet yet. This is the way that many extrasolar planets have been found, and so we are very confident that the planet exists. We assume it is made of rock, but we aren't positive about that. If it is made of rock, it is a little larger than the Earth, and the force of gravity will be a little (but not too much) hotter higher. If astronauts were to visit this planet, they would be able to stand and walk around. We don't know if the planet has water. We don't know if the planet has an atmosphere. It's gravity is strong enough that it could easily have both of these, like the Earth. But because we haven't seen the planet, we cannot be certain. Likewise, we don't know if there is life on the planet. We don't even know if the weather is right for life. All we really do know is that, if we were to magically replace the planet with the Earth, the life on our planet would likely survive. So, in short, astronomers are discovering more and more small planets around other stars. This planet could be a lot like Earth, and it could be hospitable for life. But it also could be very different from Earth, and completely devoid of places where life could exist, let alone life itself. We still have a long way to go until we can claim to have found a truly Earth-like planet, but this discovery brings us much closer. There is also a video of the press briefing announcing the planet's discovery. Thank you for this post! I teach astronomy in Colleyville, TX and have spent many hours over the past week fielding questions from students who received very poor information from the news shows. I even showed a few particularly bad ones in class to aid in explaining to them that they really need to process what they hear and not believe everything they see on TV. Good work and thanks, again!